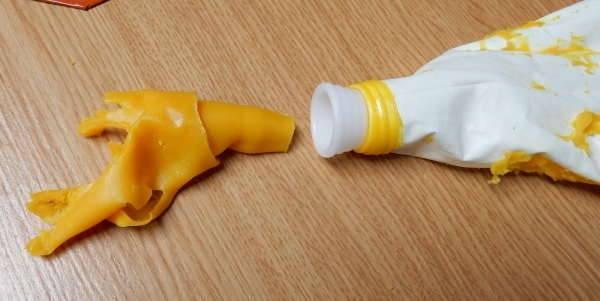 Way back in 2012, I had an accident while working with my Opaque Gummy recipe in which I grabbed a can of evaporated milk instead of the intended can of sweetened condensed milk. The result was inventing a flexible form of chocolate. I’d only just begun seriously testing variations on the recipe when we got baby Robin and then we were off to England, so the whole project fell by the wayside. But once I knew I was going to the 2016 Austin Cake Show to teach classes for kids, I decided it was time to perfect that recipe and use it to go for another Innovator Award. That award came about when some of the show’s amazing judges weren’t happy that my 2012 entry didn’t even place because nobody knew how to judge it, and I then was the first winner of that award in 2013 for other gummy displays. It also won a Silver in Masters – Special Techniques Not On A Cake. I wasn’t expecting to medal, let alone technically win the category as no gold medal was given (a decision I 100% agree with because this entry is not gold-level material in Masters). It’s also funny because just as with the Lady of Shalott piece entered into the same category so many years ago, one of the judges still said on the feedback form that I should have put it on a cake. Heh. The next thing that happened was a bunch of my friends got mad at me for putting the recipe on the entry because they think I should be monetizing it. But I don’t want to be in the candymaking business, and I’d feel like a jerk if I said, “LOOK AT THIS COOL THING I INVENTED…now PAY UP if you want to use it too!” But if you too feel that I should get paid for my efforts, feel free to buy one of the ebooks listed in the sidebar of this very blog. I do like being paid, but I also like being known as an inventor who will generously share my findings. So let’s get to the sharing! It is chocolate mixed with evaporated milk and hydrated gelatin so it stays flexible for at least a few days (or longer, depending on various factors), even when chilled. Whatever kind of chocolate you put in it. If you use dark chocolate, it tastes like dark chocolate. If you use milk chocolate, it tastes like that. You can also use white chocolate or candy melts. The texture is a bit strange when you first try it, because it doesn’t have the same mouth-feel as just eating plain chocolate. But it does melt on your tongue like chocolate, so very thin pieces yield a surprising chocolate flavour in a chewy style candy. Some of the folks who have tried it liken it to a Tootsie Roll, but with a deeper, truer chocolate flavour. 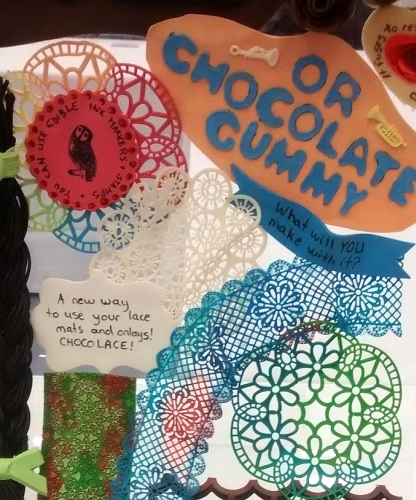 Because before this, your main choices of edible media for sculpting, pouring, casting, or modelling were fondant, gumpaste, modelling chocolate, royal icing, sugar, isomalt, or a fairly expensive product often called “cake lace”. I also use gummy, but that’s a weird, rare thing that hardly anyone does. Fondant, gumpaste, and modelling chocolate are great in many ways, but they are fragile when dried so you can’t use them on a moving/motorized part, plus when transporting a cake you have to be careful about damage. Modelling chocolate can often be warmed to be flexible again, but is still prone to cracking when it firms up. Royal icing is particularly delicate. 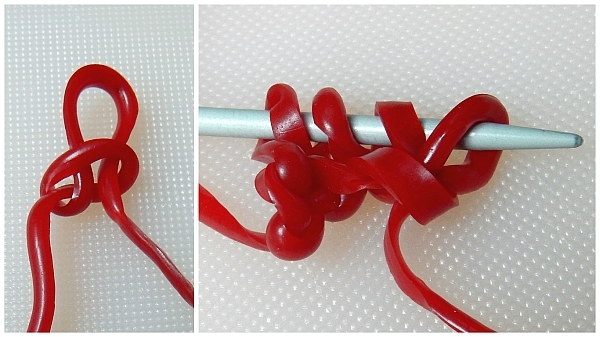 Straight sugar poses many structural issues for decorators, and while isomalt is a good substitute for poured, pulled, and other sugar techniques, it too is very fragile. Cake lace powders are incredibly expensive, and many people have invested a small fortune in silicone lace mats that they then treat as very precious for limited use because of the expense of the powder. Gummy has been very useful to me for creating translucent effects that stay flexible and don’t cloud over or melt as quickly as sugar or isomalt. But when dried it takes on the texture of PVC and isn’t necessarily fabulous to eat. Also, it can’t be piped because when it’s liquid it’s super-runny, and it solidifies very quickly. It is also typically too fragile to use in the tiniest lace moulds, or it comes out so floppy that it turns into a big sticky mess. Flexible chocolate tastes good, pours and casts like gummy in sheets on texture mats or in moulds, can be piped into strings that can be treated like strings of modelling chocolate or fondant but won’t mush together when handled, works well in onlay style moulds, and can be used in lace mats for a tasty, inexpensive alternative to cake lace powders. 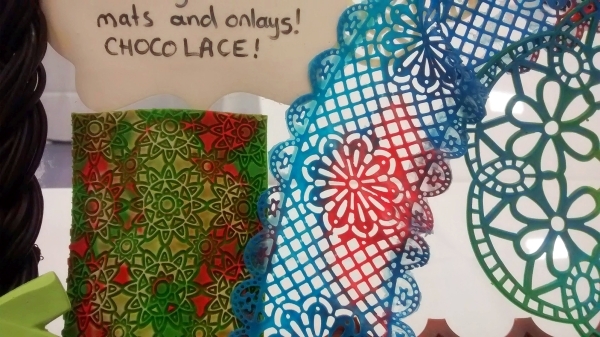 And because white chocolate versions can be coloured with gel colours, lace mats can be brought to new life with stunning, bold colour at a fraction of the cost. 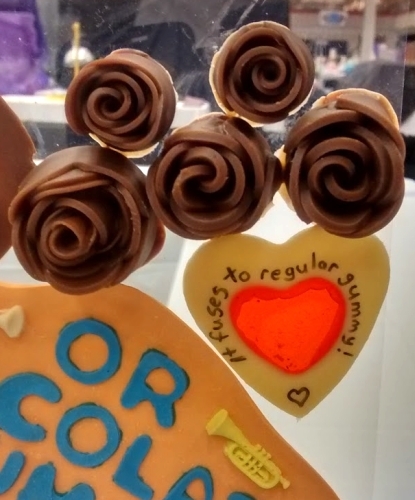 You can even write on flexible chocolate with edible markers without any colour bleeding, so long as you let the pieces dry a bit first. 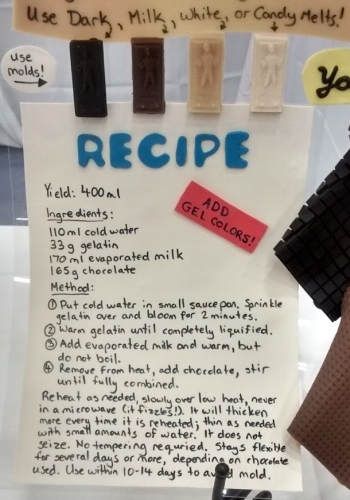 The recipe written in edible marker on a white candy melt version of the recipe with Americolor Bright White added. The blue title is the same batch tinted blue and cut out with letter cutters. I’ve based this recipe on the small 170ml cans of evaporated milk available in the UK, but you can scale it up or down as needed, provided you do the proportional math required. This much yields 400 ml, which is enough to pour one very large sheet, to fill several lace moulds, or to pipe in many designs. While you can use various kinds of chocolate, they each do affect the end result as will be discussed later in this post. Some chocolate has more cocoa butter than other types, and some of waxy fillers. You should test the recipe using the chocolate of your choice in the methods you wish to use it well before it matters. Never try a new, experimental recipe when you are on deadline! For help on estimating how much gelatin you need, see this post, but know that 33g is a bit more than 4 US envelopes. 1) Put the cold water in a small saucepan. Sprinkle gelatin over the water, mixing gently if necessary, and allow to bloom for 2 minutes. 2) Warm gelatin over low heat until completely liquified with no more granules visible. 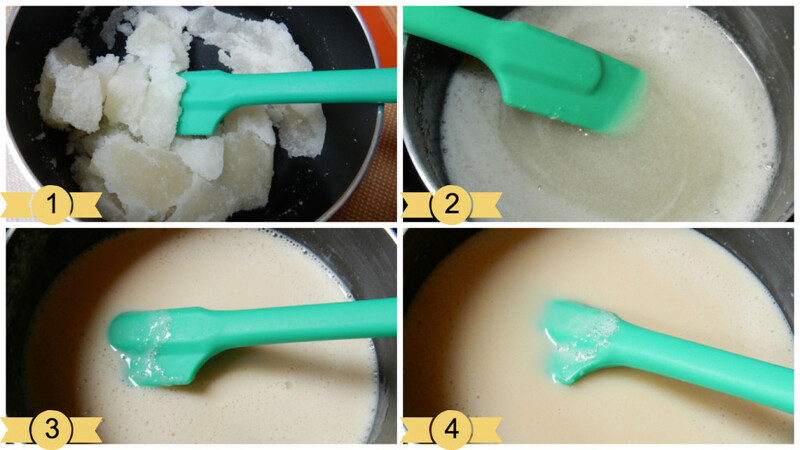 3) Add evaporated milk and warm, but do not boil. 4) Remove from heat, add chocolate and stir gently until combined. Reheat as needed slowly over low heat, never in the microwave (it fizzles and burns). It will thicken more every time it’s reheated, but you can add small amounts of water to thin it. It does not seize. No tempering required. Use within 10-14 days to avoid mould growth. 1) Sprinkle gelatin over water and mix gently if needed so no grains are left dry. Allow to soak the water for about 2 minutes until it becomes a stiff mass you can break into soft chunks. 2) Heat gently until completely liquified and no granules are visible. Don’t worry about the foam. 3) Mix in the evaporated milk, heat until very warm but not boiling. 4) Remove from heat and mix in chocolate. Mix gently and slowly until all lumps of chocolate are completely melted. 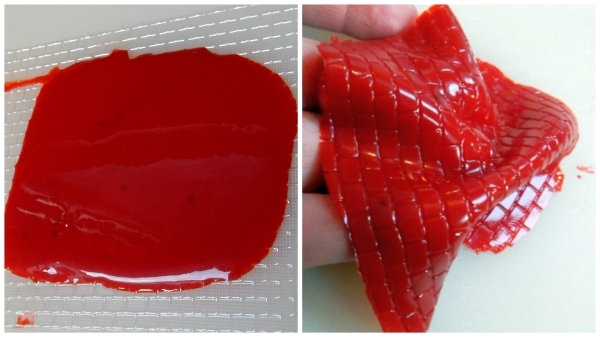 If you’re making very thick candies, use less gelatin and water so they’re not as hard to chew. Change the above list to 57 ml of water and 17 g of gelatin. 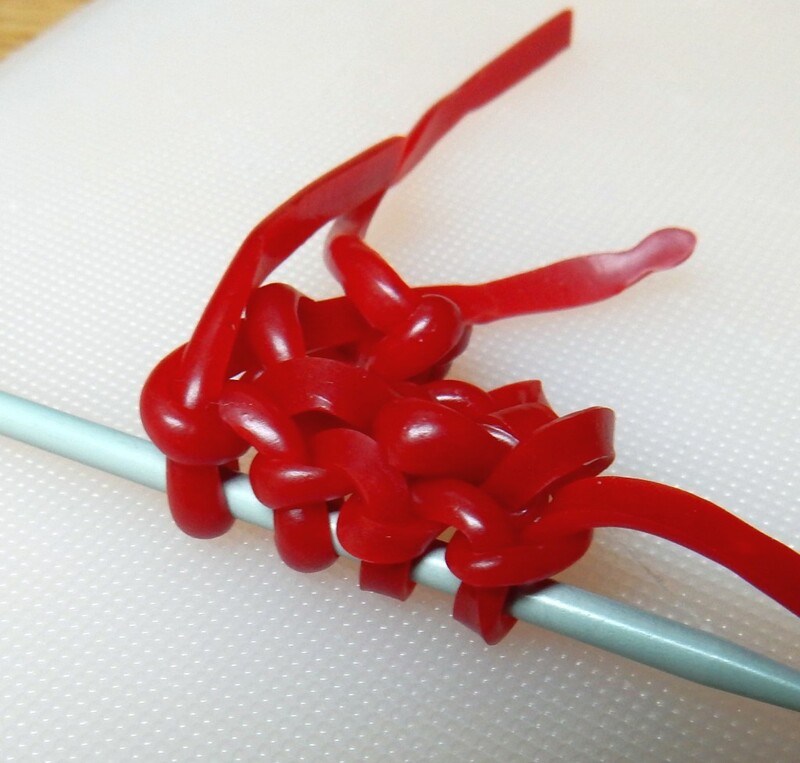 But the 33 g of gelatin is needed for the strength to pull out of the lace moulds without snapping. Keep in mind that any application will have a bit of shrinkage over time as it dries out. How much depends on how long it’s dried, what kind of chocolate was used, whether or not you added any extra water to thin it as it thickened on multiple reheatings, etc. See the shrinkage section below for more details as it applies to lace. When you first mix the flexible chocolate, it is very runny. 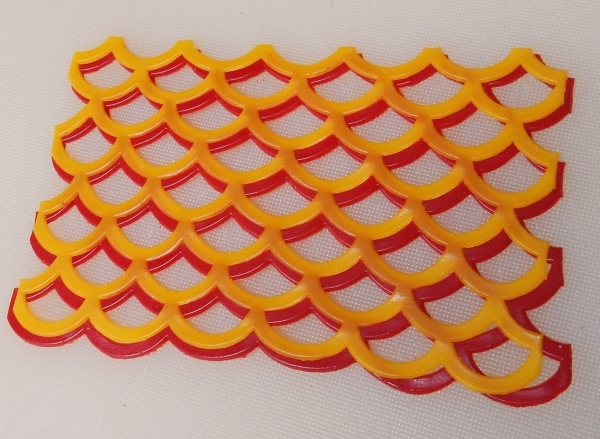 At this point, it’s terrible for piping because it’ll just flow out of the bag, but this super-fresh consistency is perfect for lace moulds, onlays, and anywhere you want a very thin fabric effect. White chocolate and candy melts stay softest longest, so depending on the chocolate you use, you may find that your first pouring is too delicate. If this happens, just pull it off of your texture mat or out of your lace mould and put it back in the pot. On the second heating, it should be good to go. Just as with gummy, one of the easiest things to do is pour the stuff into a fun silicone mould, let it firm up in the fridge, pop it out and voila, you have a candy. The main advantage here for having flexible chocolate instead of just pouring regular melted chocolate is if your mould has a lot of small bits that break when you try to do regular chocolate, they’re more likely to come out intact if the chocolate can bend to your will. Or maybe you just want to make some chewy, chocolate candies to eat. I haven’t had a kid reject one of these yet! 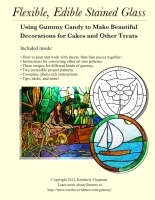 Pouring gummy on smooth surfaces or texture mats is a core procedure for my Flexible, Edible Stained Glass technique, so if you’ve read that ebook you probably already know how to do this. For everyone else, the nutshell version is you can pour warm (NOT HOT!) gummy or chocolate gummy directly onto such surfaces, tip it around gently to make an even puddle, and then let it cool fully (you can pop it in the fridge to speed up the cooling, but be sure to have it supported on a firm surface such as a thick cutting board). You then peel it off and have an edible fabric that is smooth on the upward side but takes on every detail of the texture on the underside. 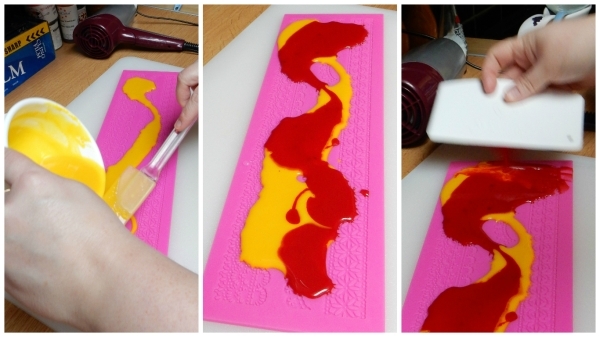 White flexible chocolate tinted red with Americolor gel, poured onto a small brick texture mat. About ten minutes later, I pulled off a very soft cloth with the brick pattern on one side. When pouring onto plastic sheets, it is essential to cool the medium as much as possible while it’s still liquid first, because plastic sheets will warp under the heat and could even be damaged if it’s too hot. A small amount of warp isn’t a problem; just be aware that if you pop the warp downwards, the sheet will be thicker in the middle and very thin at the edges, and if you pop it upwards the opposite will happen. 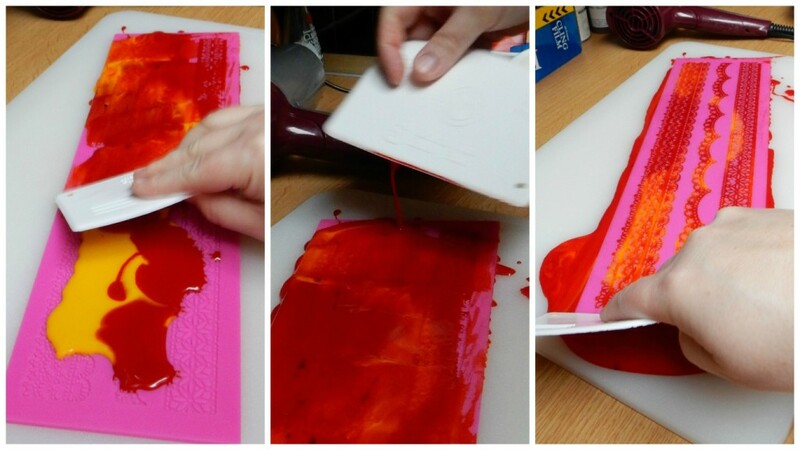 The best thing to do is to stand there and gently pop it back and forth as the gummy or chocolate gummy sets up, and then leave it in the downward position at the end, taking care to pour a sheet much larger than you need (remember that excess can go back in the pot, so it’s not wasted). Upper left: dark flexible chocolate poured onto a silicone grid mat, trimmed to a square, folded while still soft into a triangle shape. Lower left: milk flexible chocolate poured onto a houndstooth texture mat, trimmed to a square and folded into a triangle. Upper right: a cookie-cutter cutout bit of a larger white candy melt sheet tinted with Americolor Bright White, cast on a smooth surface, written on with a black edible ink pen. Lower right: the same white-tinted candy melt batch with Americolor Super Black added, cast on a smooth surface, cut into a rectangle, with a patchwork cutter used on the aforementioned white sheet for the Jolly Roger. Very lower right: a mini purse made with dark flexible chocolate cast onto the Marvelous Moulds Alligator Skin impression mat, trimmed, folded and fused together with more liquid flexible chocolate around a modelling chocolate centre, accented with white candy melt flexible chocolate tinted yellow and cast in a First Impressions bead mould. Being able to use finely detailed lace moulds is one of the most exciting prospects of flexible chocolate. So many decorators have many of these expensive moulds, but don’t use them often as the lace powder they’re designed for is also very expensive. 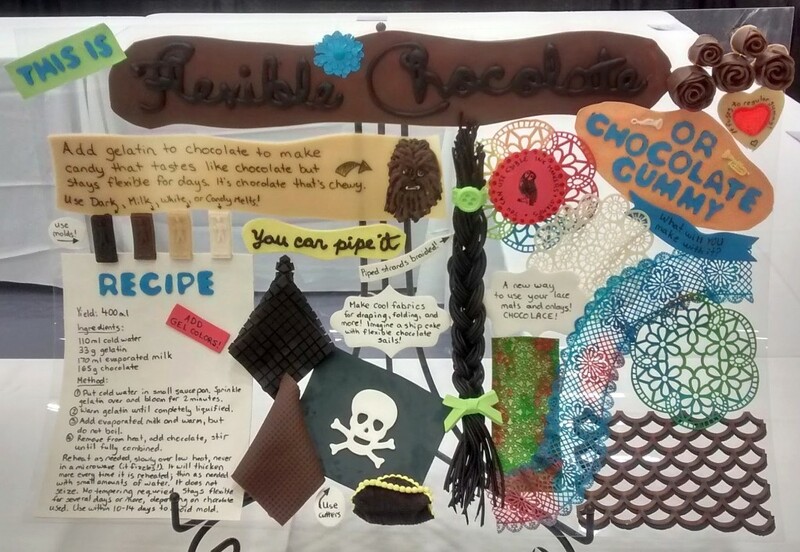 Flexible chocolate gives decorators a much more budget-friendly, household-ingredients option. Plus the results taste like chocolate! My early experiments with a very shallow, finely detailed lace mould kept failing because there wasn’t enough gelatin to keep the lace together. In the first two photos here, you can see the torn result and the chunks left behind in the mould. I tweaked the recipe using a deeper mould (top right), and then finally got a good result with that first mould (bottom). 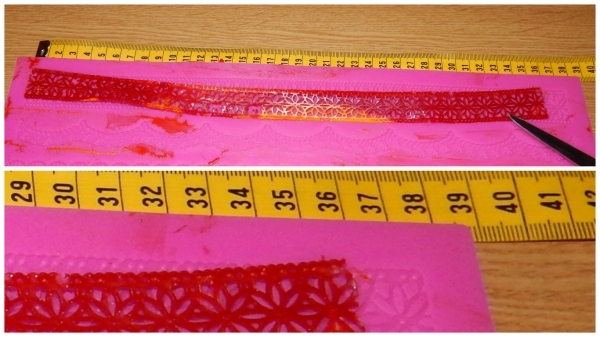 There are a few key tricks to getting a good result out of a lace mould, especially very shallow ones with superfine details. First, you need your flexible chocolate mixture ready to go, stirring frequently as you prepare other elements to ensure a skin doesn’t form on top. It needs to be very warm and very runny. 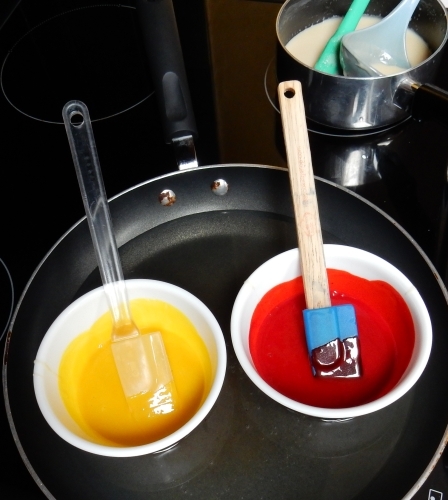 If there are lumps, work them out with a silicone spatula or scoop them out. The medium must be a thin, even, pourable liquid. 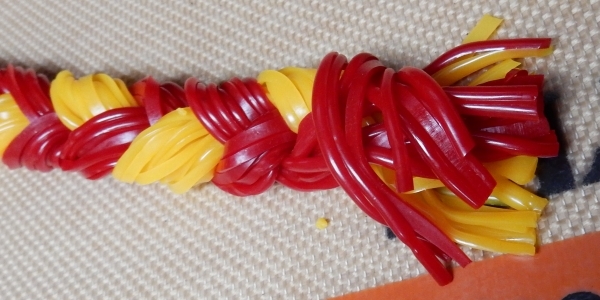 White flexible chocolate mix with red and yellow Americolor mixed in. I keep small amounts like this in little bowls and melt as needed in a pan of water, kept warm on low heat on the stove (NOT BOILING). Protip: doing this over many hours in a hard water area with a cast iron pan will mess up the pan’s seasoning. Sigh. So use a nonstick so the calcium deposits wipe off when you’re done! While your mixtures are keeping warm, heat up your mould and its support surface, especially if your kitchen is cold. Our Austin kitchen was cold with air conditioning and our UK kitchen is very cold in winter. Unless your kitchen is really, really warm, don’t skip this step, because the medium will set up in the cold silicone lace before you’ve finished pouring and getting out bubbles. If you have a marble slab for chocolate, you can heat that up and use it to keep the lace mat warm instead. I want one! I use the highest setting on a clean hairdryer to heat up our largest plastic cutting board (on the back side so I don’t have to deal with the gutter around the edge). Once that is toasty warm, I heat up the lace mat itself, and then right at the end also heat up the plastic scraping tool I’ll be using. Once everything is ready, the next trick is to work quickly before things set, but thoroughly so you get the best result. You need to pour your flexible chocolate mix over the mould in whatever colours you’re using (in this case the red was so strong it overpowered the yellow, but you can see on my entry that other colours blend nicely), use the scraper to first pull some towards one edge to ensure the recesses are all filled, then turn the scraper around and pull-smush the medium along and all over the recesses, pushing down as you go to force it down inside. Go back along once more to ensure thorough coverage and – if it’s still liquid and you have time – pick up the whole assembly and give it a few solid whomps to help knock out any bubbles. 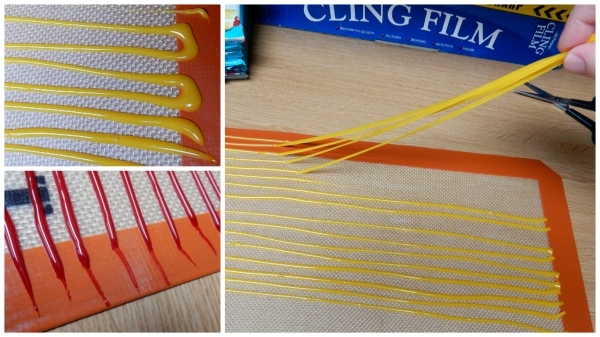 From L-R: pouring yellow along the lace mat, then red, then ensuring the first edge is completely filled by using the scraper back towards it. Then go back over firmly with the scraper to scrape off any excess. It’s okay to let it flow overboard a bit, because you can peel it up later and reuse it (albeit as a mixed colour if you’re using multiple colours). L-R: using the scraper to spread the flexible chocolate all around and push it into the recesses of the mould, going back the other way to do likewise, and then a final firm scrape to get excess off and reveal the lace pattern. Before it sets up, quickly scan for gaps, and if you see any, add a bit more of the mixture and shove it down with a small spatula or a clean-ish corner of the scraper so you don’t make too much excess to be scraped away. Stop if you see the surface beginning to pull when scraped. See the gap in the lower left? I plopped some more of the yellow in there and smushed it down. Again, the very strong red dominated it, but you can see the orange tinge. Can you patch holes once it’s set up? Sort of. Like gummy, flexible chocolate is self-fusing, but those bonds are never as strong as when it’s all poured together as one cohesive unit. So if your lace is fully set and you see a hole, you can dribble some fresh stuff in, push it in tightly, scrape carefully to not disturb the set stuff, and then let it set up again. Then when removing it you’ll have to be extra-careful at those points. 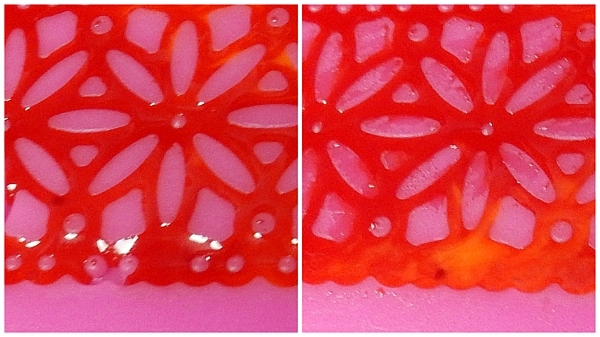 If the lace is super-thin, there may not be enough surface area for a bond to occur. But remember: you can pull it out, rewarm it, and repour it, although you’ll lose any colour marbling you had. Depending on how warm or cold your kitchen is, lace should set up within five to ten minutes. To be extra safe, I like to transfer the whole thing – board and all – to the fridge for a few minutes once it is no longer flowing. Don’t leave it in the fridge for hours, because if the lace mat is very cold it will be stiff and that makes it harder to remove your lace. If you’re feeling nervous, poke the puddle excess around your mat: if that’s very firm to the touch, your lace should be fine too. If the excess puddle gives way to a poke at all, leave the whole thing to set up longer. Once it’s definitely set, pinch back one side to start the edge coming out. Then flip the whole thing over and let gravity help you ease it out. Remember that it’ll be fairly sticky when it’s fresh, so try to keep it from folding on itself. Some very fine details may require gentle pulling. You can tug on it a bit, but very tiny pieces will snap off so be careful. Once the excess pool is this solid, the whole thing is definitely good to go. Get that excess out of your way and remelt it later. Bend the edge of the mold back to start one side going, then flip the whole thing over and carefully tease your lace out onto your board. 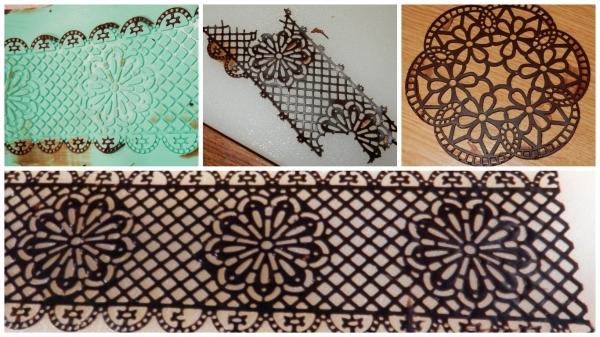 Once you’re done, you should have some very soft, flexible, chocolate lace! My show entry had several lace samples, including a long bit that I mounted ruffled. The dark pink and two shades of blue mixed much more nicely than the red and yellow in the sample photos above. To the left is a piece I made solid, as in I didn’t do the final scrape, so it was like combining the lace technique with pouring on a texture mat, for a thick, relief fabric. The two most likely problems you’ll have once you get it out are finding small holes where you had bubbles or didn’t fill the space, and places where excess that wasn’t scraped away is stuck on. The second problem is easy to fix: just trim it away with an x-acto knife. The first can’t easily be repaired without risking creating a blobby mess. Unless it’s a competition piece where you think you’ll lose points for it, just work with it. Fold the broken bit into a pleat or use the cake decorator’s standby fixit and cover it with a flower or other element! A wider view of this section of my Austin entry. The rainbow lace in the top left and the blue-green in the bottom right are the same mould I got in a set at a bargain store along with the one used for the white lace in the middle. The upper left one had some bubbles in the middle so I covered it with a scallop-edge cookie cutter cutout on which I’d done some writing and stamping with edible ink markers. Where the white lace was missing some bits that tore off, I folded it under other elements. These were still soft enough to bend into shape and then change it. If you leave a bent shape to dry for several days more, it’ll eventually harden into that shape. After a week or so it’ll become brittle. This piece was four days old when I took this photo, but most of the shrinkage occurs after the first 24 hours. Shrinkage will vary depending on how much water is in your mixture. Be sure to account for this when planning pieces! Lace options are endless, from figures to fashion cakes, from small pieces to big ones. 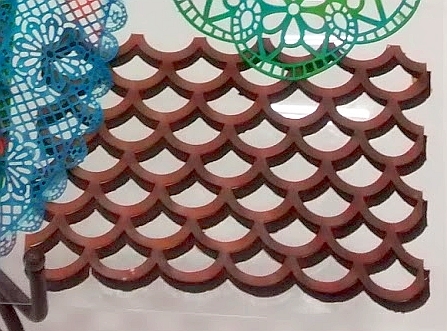 The 2017 theme for the Austin cake show is “Old Lace; All Things Vintage” and while we’re still writing the official definition, this new technique will hopefully give lots of folks some serious inspiration! Dark flexible chocolate in the back, milk over top offset slightly to make a shadow effect. The Marvellous Moulds onlays are engineered very well to have a firm cutting edge meant for more traditional icings like gumpaste, but this also happens to make them super easy to use with flexible chocolate (and I would anticipate with gummy as well for translucent effects). Just as with the lace above – albeit much less finicky – you simply pour a very liquid version of the medium over, use a scraper to ensure all of the recesses are filled, give it a flap or whack to knock out bubbles, and scrape the excess away. And just like with the lace moulds, I recommend warming up the whole assembly in advance with a hair dryer to give you time to work with the flexible chocolate before it starts setting up on you. Fill all of the recesses, scrape off, let set, use a tool to pick out the bits you don’t want (and remelt them later! ), then set it aside to firm up for a few hours or overnight. If the pieces are fairly fresh, they will stick together all on their own (very annoyingly so, making it hard to line them up at all). If you’ve let them firm up a bit, lay them together as desired and then hit them very briefly with the hair dryer on LOW. If you use high, they’ll blow around and melt really fast. You just want to warm them up long enough to get them to stick together. Keep in shrinkage in mind, and make sure you let pieces firm up for the same amount of time. A fresh piece is going to be bigger than an overnight piece. You can also see that this colour combination means some of the red is showing through the yellow, because the yellow is so light and the red so dark. I think the milk chocolate and dark chocolate were a much better combination, and probably would taste really nice too. Those together would make for a superb accent around a chocolate fondant cake. As mentioned previously, flexible chocolate thickens up fairly quickly upon a few reheatings and coolings, or being left in the pot at room temperature overnight with just a light covering of cling wrap (ie don’t stick it down, just lay it on top for cleanliness). 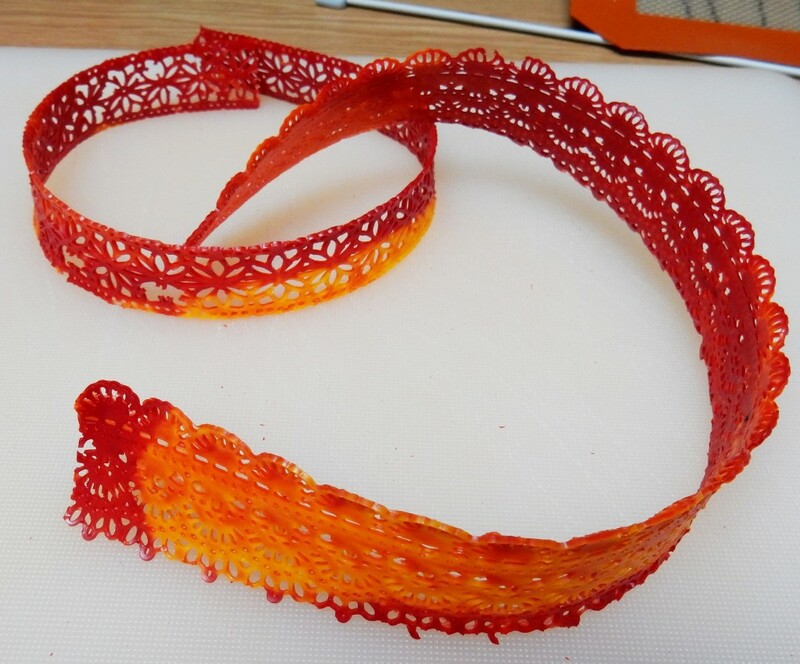 If this happens and you want it to stay thin and runny because you’re making a bunch of lace, just add small amounts (about a teaspoon or so) of warm water at a time to the melted pot/bowl and stir to combine. If it ever gets so thick that it seems to not want to re-melt in your pot (ie it starts to sizzle on low heat instead of melting), that means there’s too little water left to liquify it at all. Add a bit of warm water and stir, and it’ll come right. If the fat ever starts to separate, remove from heat and add a bit of warm water, then mix thoroughly (similar to fixing a “broken” ganache) and your emulsion will be rescued. Dark chocolate thickens fastest, followed by milk chocolate, and then white and candy melts take the longest. Dark in particular is thick enough to pipe fairly quickly, making it a good choice for piping flexible lettering or very round hairs, but milk and white can also be used with either more work to thicken it or accepting a flatter-bottomed result. Dark chocolate makes nice, round strings very early on. White chocolate seems to take a lot more thickening and even then comes out softer for a flatter bottom. Both of these were piped with a #3 tip. For lettering, you can freehand it or print out any text you want in any size or font you want, pop that printout under a translucent plastic cutting board or even waxed paper, and then simply trace the lettering as desired with the appropriate tip size. Of course you can do this with regular melted chocolate too, but the difference is there you have to be very careful not to break the pieces, and it’s hard to apply them to a curved cake. With flexible chocolate, pipe your letters, let them set up, then transfer them wherever they need to go without worrying about breakage. The only concern is that if they come out very floppy, it can be hard to keep them aligned properly. If that happens, you can let it sit out overnight to firm up just as with the lace and onlays above. It’ll still be flexible the next day. Remember to keep potential shrinkage in mind. For my entry I piped the main title with a #10 tip and the “you can pipe it” words with a #4 tip. In both cases I printed out the words I wanted in the right font and size, and simply traced over them on a translucent plastic flexible cutting board. Chewie is chewy. And giving me a most appropriate look for that pun. When piping, get the medium fairly hot (but never boiling) so you have the longest possible time to pipe it before it solidifies in your piping bag. I strongly recommend using good-quality washable bags, since disposable bags may melt or burst under the heat and pressure you’ll need to apply. I tried it once in a soft silicone bag and thought the bag was about to rupture! I also got better results with a standard metal tip and coupler as opposed to the plastic tips designed for candy melts. Solidified flexible chocolate pulled out of a bag and tip. One of the popular elements of my Austin entry was the large braid, and I must say that I was extremely excited with how that worked out. Anyone who has ever tried to make hair with edible media knows that it can be very difficult. I’ve experimented with vermicelli in the past, and I know from sculpting experience that in general you’re better off suggesting waves and locks rather than creating lumpy strings. 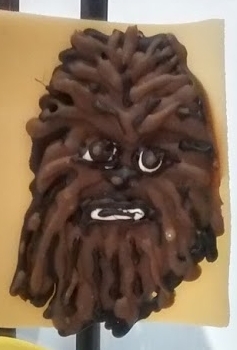 But there are times you want to create long hair and style it, which is difficult with fondant, gumpaste, or modelling chocolate since you’re going to munge the strands as you work with them. The braid on the Austin show entry. It stayed flexible for over two weeks. I fastened the end with green-tinted white candy melt flexible chocolate cast in a Wilton ribbon and button mould. Click for a larger view. Photo by Lori Cramer. 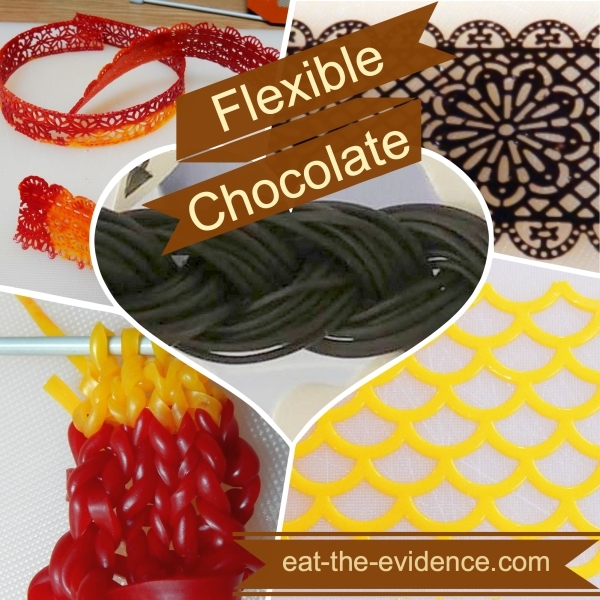 Flexible chocolate is an amazing breakthrough medium for those who want to make individual hairs or strings and be able to braid, twist, wrap, tie, or even knit them. It begins with piping, so the caveats mentioned above still apply: dark chocolate works best for a nice, round hair, all varieties stay flexible for at least a day or two but white stays flexible longest, and once it’s set up you can do all kinds of things with it. 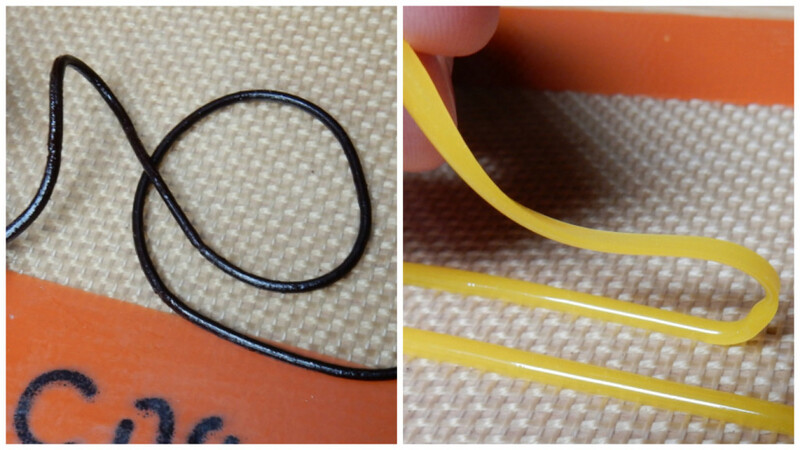 Pipe your strands onto a nonstick surface such as a silicone mat. If it’s really runny you can go back and forth and then trim the looped ends off later. If it’s firmer, you can draw out the strands to points which look more natural as hair. If it’s really thick you can just pipe nice round strands that end when you take off the pressure, just like royal icing. Whichever you use, it’s as easy as letting them set up for a few minutes and then carefully pulling them up off of the mat. White chocolate strands are stickier than dark chocolate, and want to clump up on themselves more. If they do, you can gently separate them. 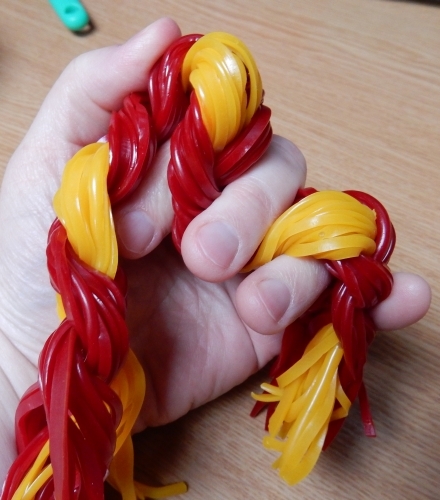 This white flexible chocolate mix tinted yellow and red was still fairly thin when I piped it, so the strings came out flatter. For the yellow I did the back-and-forth piping method and later trimmed off the looped edges with scissors. For the red – which was a little thicker – I piped to points. Then I peeled them all off of the silpat and set them aside. Once you have strands, gather them into bunches as desired, taking time to make sure the strands are all lying fairly smooth. 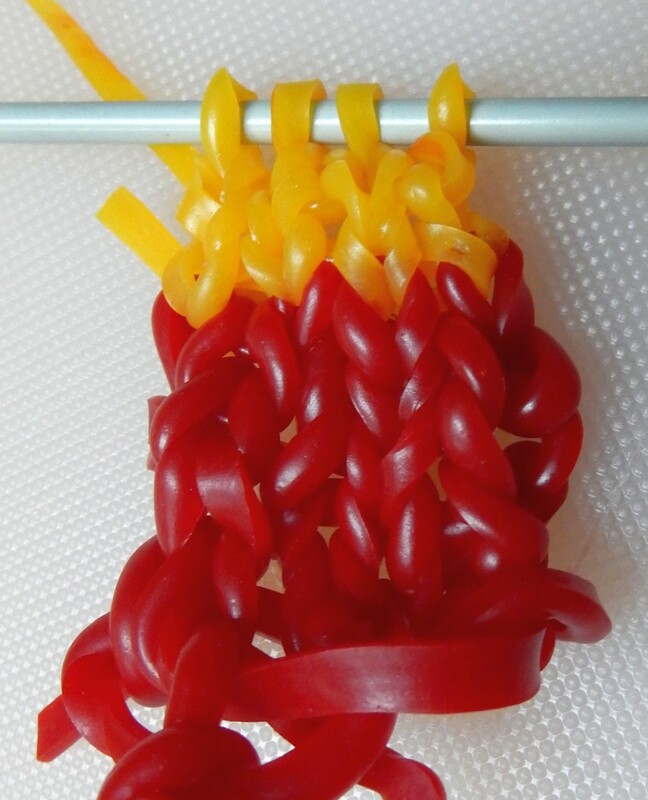 Lay out three bunches and then braid them together as you would any other string. Don’t worry about the top coming unravelled; just work the braid downward until the strands are falling more into place, then go back up to the top and do a sort of backwards-braid up there to get it all neatly in place. Lay out your strand bunches. Braid downwards as usual, then backwards-braid at the top if it’s come unravelled at all. At this point you could hold things in place with more flexible chocolate cast as ribbons; just add a bit of melted medium on the back of the ribbon and that will hold it and the nearby strands in place together. Yes, this is braided chocolate. It looks like licorice, but it’s white chocolate. If desired, trim the ends. Since this was freshly made flexible chocolate, it was still very soft and floppy. This could be bent or styled any way as desired. After a day or so, it would stiffen up a bit but still be flexible. If you’ve got strings, you can make tassels. Bend some strands in half and wrap another one around. Secure with a bit of the melted stuff. Make them as long or short, full or thin as desired. There was a Chinese New Year dragon cake at the cake show that had a real-string tassel all the way around, and generally speaking having inedible elements on your showcake loses marks with judges. If only they’d known about flexible chocolate, they could have made a lovely white chocolate (tinted with Bright White) edible feature instead! In that case to manage them better and keep them from all sticking together, I’d advise making the strings in super thick white flexible chocolate, then letting them sit overnight to firm up a bit and get less sticky. A corn starch dusting could help reduce stickiness as well. We’ve all seen very nicely rendered knitting-like textures on cake. People have done it in royal icing, extruded fondant/gumpaste, and with texture mats. But when have you ever seen an edible medium actually knitted on actual knitting needles? Well here you go: I took the strands from the braid, some knitting needles, AND I KNITTED CHOCOLATE BECAUSE I CAN. And now you can too. I made a real slip knot and did a real knit-cast-on of several stitches. I didn’t just knit. I PURLED. That’s right, this is some chocolate stockinette stitch up in here! CHOCKINETTE STITCH. That’s a thing now because I said so. CHOCKINETTE STITCH WITH COLOURWORK ZOMG. And again, that was thrown together in less than five minutes with a screaming toddler nearby. The short strands meant I kept having to introduce new strands. Imagine if you had time to make a really long string (I’m imagining a rig where you pipe it hot at one end of a chilled silpat conveyor belt with a spool collector on the other side, so someone invent that for me please); you could knit all kinds of fabrics for your cakes, from little shirts and scarves to go on cupcakes to full-sized ones for big cakes. Team shirts! Peo says this one looks like the start of the Gryffindor scarf I knit her. 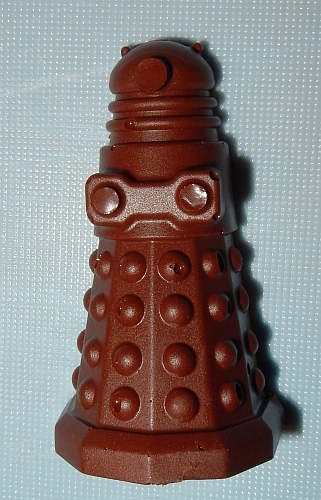 YOU COULD KNIT A DOCTOR WHO SCARF OUT OF CHOCOLATE. Someone go do that and give me pictures to post. Someone make me one of these, please. 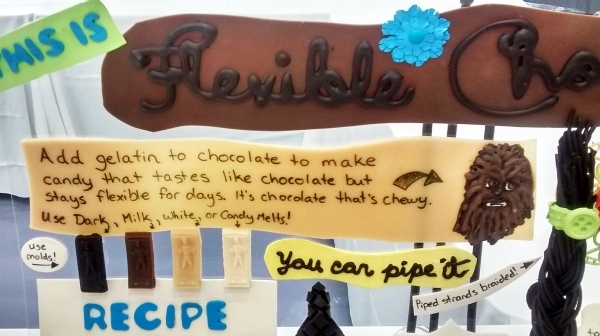 You don’t have to work with flexible chocolate only when it’s melted! One of the disappointing results I’ve had over the years with gummy is that you can’t pipe or extrude it. While chocolate gummy/flexible chocolate is an improvement because it can be piped as detailed above, results are mixed on extruding. When you extrude a soft solid, you’re basically mashing it up and forcing it through a particular hole, reformed into a new solid on the other side. With gummy, this results in a pile of mashed up bits. 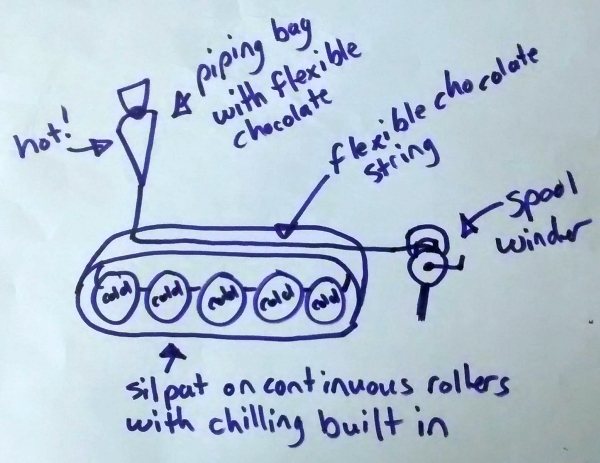 With flexible chocolate, the inherent stickiness combines with chocolate’s malleability to become that reformed shape on the other side, albeit not a very strong one. 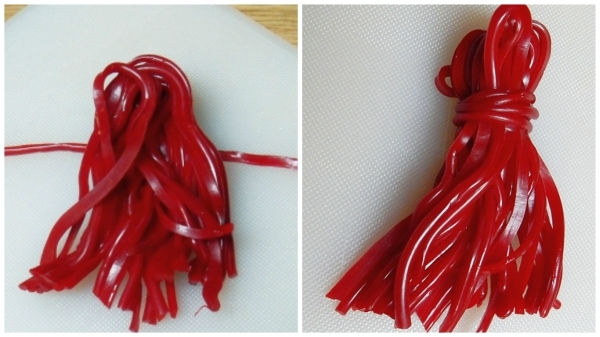 With one of the earliest experimental batches that had less gelatin, I tried extruding ropes of varying thickness, and while I was happy that it did extrude, I found the strings were fairly fragile. Having since piped the medium, I would say piping is a much better option unless you absolutely need that perfectly round rope (or other extruder shape). My first extruded ropes were exciting, so next I tried the multi hole tip. 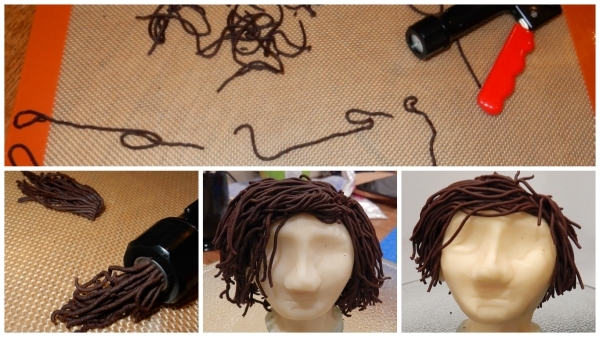 It was a lot of work to push the material through, but it worked and I whipped up a quick little modelling chocolate head to stick the “hair” on. Later I gave the head a haircut, which was definitely a fun use of chocolate! Casting sheets of flexible chocolate gives you a new way to use cutters of all sorts. Sharper cutters are better, and thinner sheets are easier to cut. 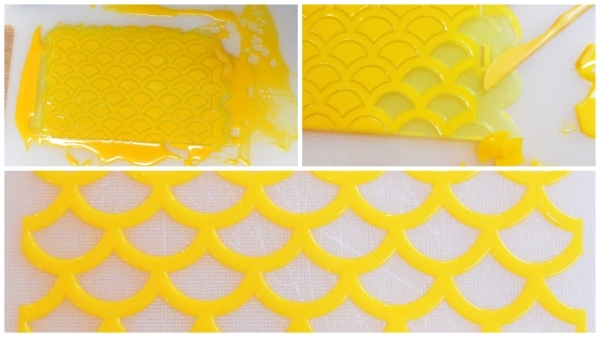 You can then affix cutouts to other sheets or directly onto a fondant-covered cake with a bit of melted mixture. For my Austin entry, I used the Wilton alphabet cutter set for several of the lettering portions, a patchwork Jolly Roger cutter for the pirate flat, medium-small oval Ateco cutters for the little notes, plaque cutters for the larger notes, and up in the corner I used the new FMM Easiest Ever Cutter (the larger one in this set) to make chocolate gummy roses. I cut the shape out of a milk chocolate sheet, spread some melted flexible milk chocolate in the middle, folded it, spread some more along the base, rolled it up, and voila, chocolate roses! Granted their edges are not the nice thin edges you get when you flare out gumpaste with a bone or ball tools, but you could easily cast thinner sheets to go for thinner edges. I added these to the entry at the last minute because I’d ordered all three sizes of that new cutter and I wanted to play. They were so easy, they went on in minutes. Also in this corner: proof that it fuses to regular gummy! I cut out a heart of red gummy, then cast some white flexible chocolate around that, let it set up, then used a bigger heart cutter to cut the whole thing. 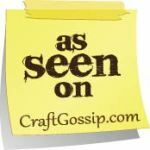 The only place cutters fail was in my test of patchwork cutters that have embossing elements. While you can easily cut any shape out, you can’t force a new indentation well onto a set-up sheet of flexible chocolate. 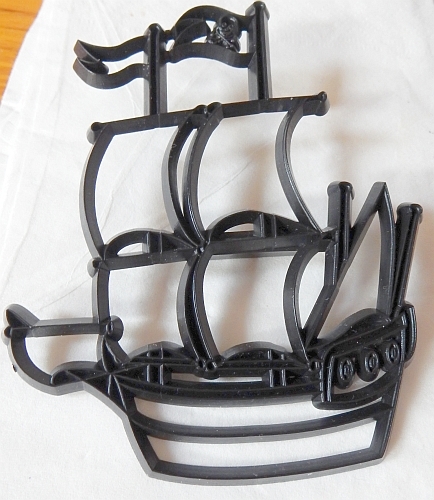 I had hoped to use my new pirate ship patchwork cutter to make a boat with big billowy sails, but the wonderful detail that makes this such a great cutter for fondant or gumpaste unfortunately just crushed the flexible chocolate sheet. The embossing details of the flag designs, wood trim, and portholes just smushed the sheet of flexible chocolate instead of cutting or embossing. I tried it on a freshly poured sheet to see if I could imprint and cut, but that just stuck to the cutter and made a huge mess. You can, of course, just use a pizza wheel, x-acto knife, or scissors to cut sheets as well. 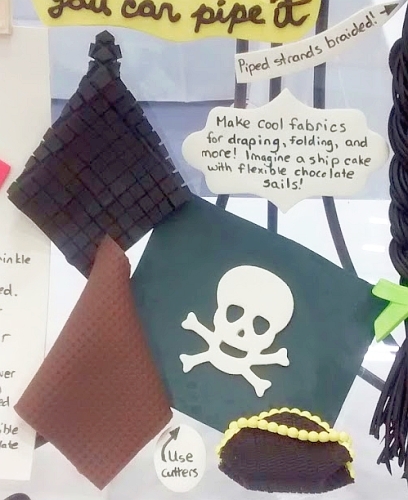 So you could make a whole pirate ship cake with big billowy chocolate sails! If someone does that, please let me know so I can post a photo! After I made the braid, I wanted to keep playing with the strings. A couple of hours later I undid the braid and revealed this important tidbit: some of the very strong red had bled into the yellow. So do keep that in mind when working with gel colours! This was the greatest disappointment with flexible chocolate: I assumed in its melted state, it would fuse nicely to modelling chocolate, but it doesn’t. It seems like it does at first, but then with the slightest tug it peels off. I think it’s melting just enough of the modelling chocolate to create a fat layer between the two substances to prevent them from actually adhering. That said, you could make a modelling chocolate thing and a flexible chocolate thing and attach the two of them (provided you have enough surface area on both sides) with regular melted chocolate. Piping gel works okay too, but not as well. 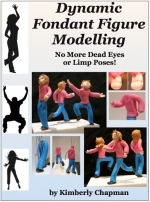 You just can’t pipe flexible chocolate directly onto modelling chocolate and expect it to stick with any strength. Undoubtedly someone’s going to ask me why you can’t just use less water at the start if you want it thicker faster. The answer is because any less water and you can’t hydrate the gelatin enough to get it smooth and well-incorporated into the chocolate. 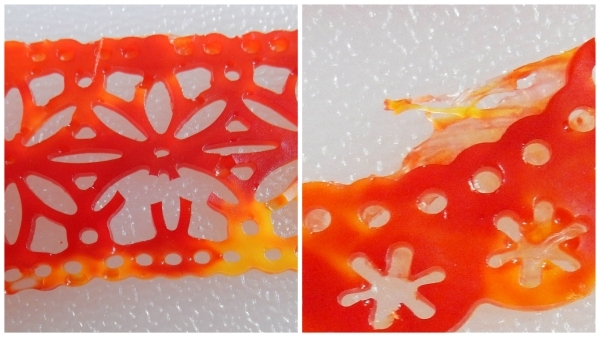 Could you use leaf gelatin or vegetarian-friendly agar? As I’ve mentioned with gummy, probably. I just haven’t gotten around to trying it yet. If I do, I’ll update this. 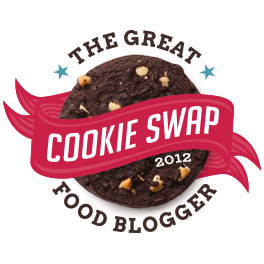 If you do and want to write a contributor post about it, talk to me! That’s all I have to report on my findings with this new medium for now. I’ll keep experimenting, and you all go play and let me know what cool things you make! I can't wait to try this! 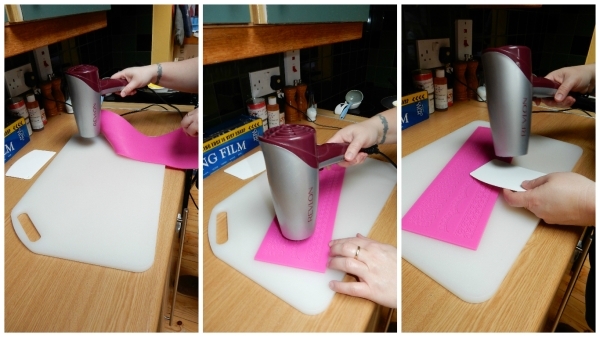 Thanks for sharing Kim….would heating pad work for keeping the counter warm and molds? Possibly, as long as you can make it lie flat. My old heating pad was really lumpy with the internal wires. If you have a better, flatter one, give it a go! I’m a certified chocoholic. You may have created a monster with this one. Condensed milk is quite different. Evaporated is very liquid, whereas condensed is sweetened and super thick. I do use condensed in the opaque gummy recipe and can guess that if you put that in the chocolate, you'll have a super thick, very sweet, almost fudge-like result. Hello, thanks for your sweet ideas. Could you tell how attach de lace to a fondant cover cake? Water? Crisco? ? Greetings from Peru. Excellent question Claudia! 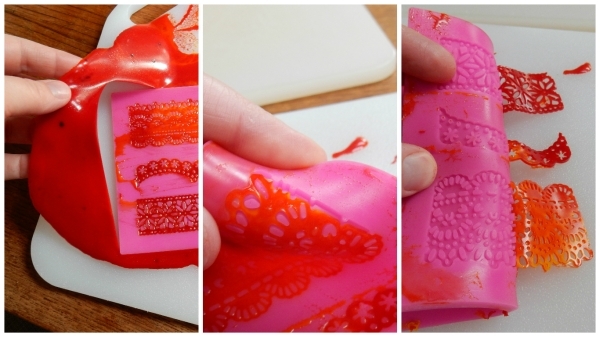 If you've just taken the lace out, it is probably sticky enough to mount directly to your fondant. If you've let it dry a bit, I would recommend brushing the fondant lightly with water in the area where the lace will go to make it tacky. If the fondant isn't getting tacky with a bit of water, a thin coat of piping gel should also work. Oh my goodness you are an absolute saint for sharing all this. And in so much detail! It won't behave like fondant, but you could in theory cover a cake in it, yes. You could either drizzle it like mirror glaze, or make a side sheet that wraps around and a top sheet cut to fit. I'm not sure it'd be great as a cake covering, but it's possible. I haven't actually tried it but it should be okay. It might be slightly less thick so you might need to warm it and cool it a bit more to get it to be less floppy. 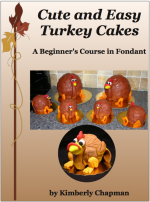 1) how does it react to fondant? will it melt the fondant due to it's water content? Hi Sharon, if you've made it thicker, cast your piece, and then let that dry, it shouldn't melt fondant. A super fresh bit of thin stuff might. Relative humidity will play a role as well, as well as how dry your fondant is. I would guess that if you did something like the lace and let that dry out a bit and then put it on the fondant with piping gel, it should be okay. As for temperature, as you approach the melting point for either chocolate or gelatin it's going to get sticky. Again, it will depend on how thick you've made it and how dried it is…chocolate melts at between 30 and 32 degrees. If you've cast a piece and it's sitting somewhere stable and not being moved around, it should be as stable as modeling chocolate or piped chocolate or any other chocolate element. The gelatin in there will help hold it together a bit better than plain chocolate, but I'd say if you wouldn't use modelling chocolate or regular chocolate at a given temperature, you should be careful with flexible chocolate at that temperature as well.